Orange Blossom Water Turns Six! 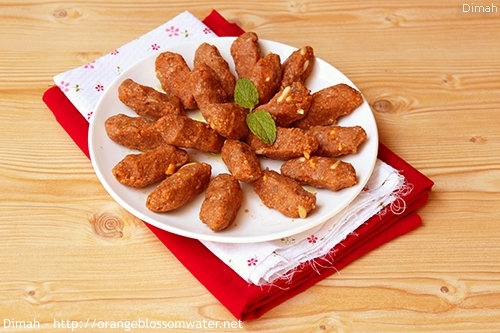 Kibbeh Naiyeh means raw kibbeh, it consists of minced raw meat mixed with bulgur and spices. Kibbeh Naiyeh Bi-Zeit Az-Zeitoun means raw kibbeh with olive oil and doesn’t have meat. It is a creation belongs to Aleppo city, served as appetizer. It is made with bulgur, tomato paste, red pepper paste, spices, onion sauteed with olive oil, and nuts.